While in flight, the wings of the mourning dove make only a gentle flapping sound, inaudible to most due to the bird being airborne. But during takeoff and landing, the sound of the mourning dove’s whistling wings is unmistakable. Bird-watchers frequently report feeling startled by a rapidly ascending mourning dove whistling past them. The whistling sound occurs because of the anatomy of the wings. The flight feathers at the rear of the mourning dove’s wing are contoured. This shape creates an audible, high-pitched vibration when the wings flutter rapidly, which sounds like the bird is whistling. Since most birds have barely audible flight and some birds, notably owls, have evolved feather shapes that make their flight almost silent, it is unusual that a bird would evolve to create sound when taking off and landing. The most likely cause for this is an evolutionary adaptation whereby the whistling sound serves as a warning to other birds that a threat is imminent. Studies conducted at Texas A&M University found that mourning doves are in a higher state of alertness after being exposed to a sound recording of the whistling sound, when compared to sound recordings of other bird noise, such as calls and chatter. The mourning dove has a limited song range, which explains the reliance on wing sounds for communications with other birds in the flock. Mourning doves make nest calls and partake in “cooing,” but are capable of very few other vocalizations. 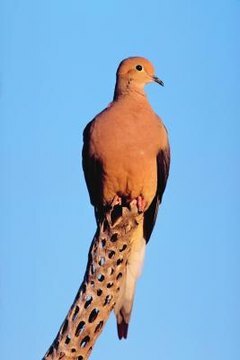 The mourning dove’s wings are important for other types of communication, as well as warnings. They clap their wings together before takeoff.